When I was growing up, and while my family lived in Ottawa, we lived on a Crescent. It was wonderful. It meant we had endless games of road hockey, hide-and-seek, sardines, baseball, rollerblading… Whoever spotted a car coming first would shout as loudly as they could “CAR” and we’d all scatter to the side of the road as quickly as we could, which was really frustrating if you were about to score. Every kid knew the reputation of every house on that Crescent. Grumpy man’s house – when the ball went onto his lawn, we’d have 10 minutes of intense debating deciding whose turn it was to go onto the lawn and get the ball back. When the elected made it back onto pavement safely with the ball, without grumpy man coming out to give us a lecture, we all celebrated. Never says ‘hi’ couple – the couple that acted like us kids were invisible, barely slowing down and looking straight ahead as they drove by. 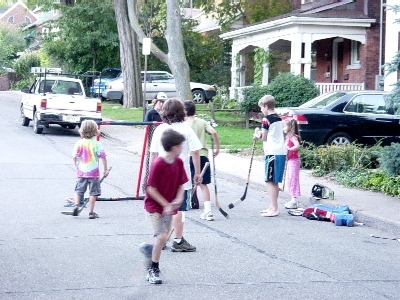 Our fans – my next door neighbourhoods were the best at this. They’d sit on their porch at night and literally cheer us on as if we were in the NHL. When we were playing hide-and-seek and I was “it”, they’d help me out by hinting which way the other kids went, but now I’m suspicious they might have done that for everyone else too. Us kids knew when we were selling the latest fundraising chocolate bars, they would buy at least five of them, even though they didn’t need them. Us kids knew the reputation of each house in our neighbourhood, even if we didn’t know the names of everyone inside. What’s the reputation of your house? Your apartment? Your place? 2. Parents listen to their kids – If their kid(s) want to do it, they’ll do it. I’ve seen Dad’s dress up like princes to go see Cinderella, Mom’s on the floor playing Candyland, and Aunt & Uncles holding on for dear life on rollercoasters. They weren’t doing these things because they were their favorite, most riveting things in the world for them to do as adults, but because they love their kids and want to give them great experiences. Parents are not going to bed at night thinking about you, thinking about your church. They are going to bed at night thinking about their kids - their worries, fears, hopes, and dreams for their children. If you design excellent opportunities for their children to explore faith, parents will come too, even if it isn’t there favourite thing yet. Show you greatly value their kids too, and go the extra mile for kids. 3. Kids are often leading the way in their family’s spiritual journey – Kids questions and repeated “but why?” are causing parents to seek out spiritual help and spiritual answers. Help parents with this and you’ve got the whole family. Parents need cheerleaders, like my next door neighbours were so good at with us kids. If you have a reputation of helping parents in all the joys, trials and tribulations of raising their kids, particularly in their faith, parents will seek you out, even if they are not sure what they themselves believe about Jesus yet. Furthermore when we partner with parents in helping their kids experience vibrant faith now, those kids have much better chance of having a faith that will stick as they begin navigating teenage and young adult years. 4. Jesus valued kids – When others, even the disciples, saw kids as a nuance or bother, Jesus valued them and brought the kids front and centre and said kids are closer to the Kingdom! (Mark 10:13-15). I want to value what Jesus values. Jesus values kids, and said, let them come to me, do not hinder them. I do not want to hinder, or be a stumbling block for any child to come to Christ. I don’t want my church and ministry to hinder kids from coming to Christ. Some questions to ponder: a. In your community, what’s the reputation of your church/ministry to kids? To parents? b. What do you need to sacrifice so you do not hinder kids from coming to Jesus? c. What do you need to do to make kids a stronger priority in your ministry?